Once upon a time, well actually in the May 2004 issue of Business 2.0, I read an article about a new bike that Specialized Bicycles of California had unleashed on the world and was instantly smitten. The article described a 16.8 lb machine that looked like nothing else on the road and combined the virtues of carbon (light weight and shock absorption) and aluminum (light weight and stiffness). In a masterpiece of craftsmanship, the two materials were laid-up by hand and baked in a mold to produce a seamless, strong and smooth frame at, of course, vast expense. It was meant to be a rolling ad campaign to highlight Specialized's engineering skills since not many were expected to be sold. In fact, only a few could be built each day but the idea was that lesser bikes in the Specialized line would shine in the reflected splendor of the Tarmac, with its glorious curved top tube. 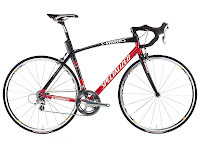 In 2007 Specialized no longer offers the Tarmac in the carbon/alu combination (sold last in 2006 as the Tarmac E5) but only as an all-carbon bicycle. While the carbon frames are lighter than the E5s, the original frame had what must be the stiffest bottom bracket ever on a bicycle, ideal for big, powerful riders. Lurking on E-Bay one day in December 2006, I discovered a Tarmac E5 frame, 2006 model, with carbon fork and seatpost at what looked like a reasonable price. The bicycle was brand-new, and had been bought nine months earlier and never built up. Already having a herd of tin donkeys I am not sure what I was thinking of but leafing through the magazine article for the umpteenth time I recalled just how much I wanted this Ferrari of bicycles and I took the plunge. To my surprise, nobody else bid on the frame and when it arrived I was delighted to see that it was still in the original packing, looking like it had never even been unwrapped. A few months of judicious buying and I had the makings of the latest Tin Donkey. Through careful bidding, purchasing one or two lightly used parts and transferring a few things from my Lemond, I have been able to put together a top-end dream bike for less than one-half the MSRP of the Tarmac last January. The only problem was the carbon handlebars, which seem to be in great demand and I had to wait a while and pay more than I had originally planned to get a set of new Specialized ones. The Specialized website has an archive section and if you go to 2005 you can see a great little Flash film showing the two elements of the frame being put together. There is also a detailed paper on the construction of advanced composite frames that includes the Tarmac in both carbon and E5 versions. I have entrusted assembly of this paragon to my mechanic, Kirk at Performance in Vienna, Virginia, and will provide him with suitable beer upon its completion. This is scheduled for Saturday, March 3rd, when the weather promises to be superb and we will start the outdoor season in earnest in Maryland with a climb up the feared Gambrill Park Road and the even more feared Harp Hill, the latter featured in a recent Bicycling magazine survey of the best climbs in America. A full report on the ride, wherein I will match the Tarmac with a Cervelo Soloist and a brand-new (completed one day before my Tarmac!) Cervelo R3. Toys for boys and fun ahead!